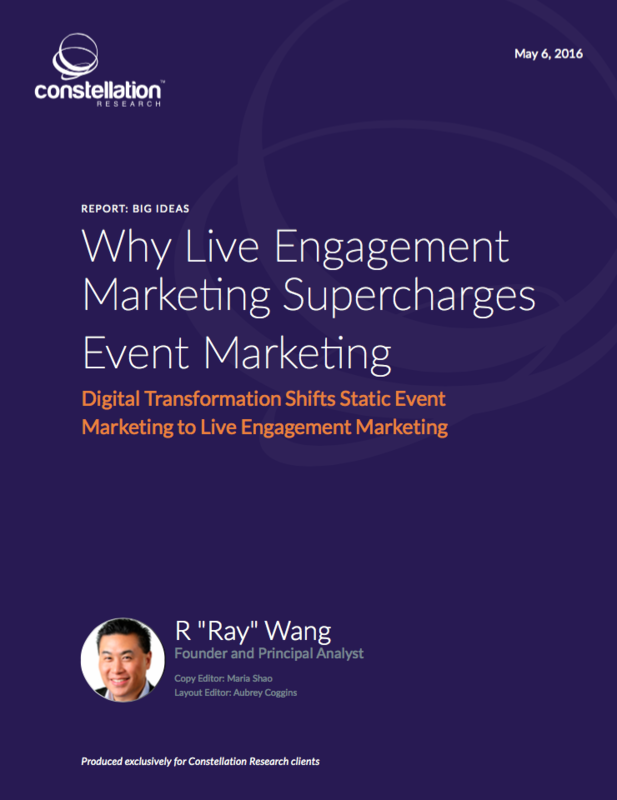 Research Summary: Why Live Engagement Marketing Supercharges Event Marketing | Constellation Research Inc. Event marketing often represents 21 percent to 33 percent of most marketing organization budgets. While success criteria remain murky at worst and sparse at best, organizations have an opportunity to digitize event marketing using live engagement marketing techniques. Live engagement marketing provides marketing teams with the capability to not only quantify event marketing activities but also identify success rates in right time. This real-time capability enables event marketing teams to make adjustments during the event that improve engagement and ultimately increase conversion rates. This report launches a new research category called Live Engagement Marketing. The category reflects the digital transformation of traditional event marketing. Are you ready to transform marketing with live engagement marketing? Are you looking to super charge your event marketing efforts? Add your comments to the blog or reach me via email: R (at) ConstellationR (dot) com or R (at) SoftwareInsider (dot) org. The post Research Summary: Why Live Engagement Marketing Supercharges Event Marketing appeared first on A Software Insider's Point of View.